The New Breath Treatment Starter Kit from the Center for Breath Treatment offers a collection of the best dental products in the market. Since the Center for Bad Breath doesn’t rely on one brand alone, it guarantees only the best products each brand has to offer. It includes DioxiRinse mouthwash, DioxiBrite toothpaste and Dentiva lozenges. It also includes step-by-step directions on how and when to use each product. Personal consultations from Dr. Dailey are also offered along with this kit. The following are the products included in the kit. DioxiRinse is an active chlorine dioxide mouthwash that instantly eliminates bad breath. This contains chlorine dioxide that acts on halitosis by oxidation and not just by masking the odor. Using DioxiRinse once or twice a day treats acute and chronic halitosis. It eliminates odor by killing bacteria that can invade the mouth, throat and tongue. Its active ingredients kill bacteria in under one minute. No bacteria also means no gum disease and bad breath. This is also great for those with braces and infected gums. DioxiRnse is effervescent so it targets those hard to reach areas in the mouth. It also contains menthol that soothes and reduces mouth irritations from tooth extractions, injuries and braces. With its oxidizing content that is safe for everyday use, DioxiRinse is also great before brushing teeth and dental procedures. The oxidizing properties of DioxiRinse remove mouth odor and stains as well. It does not cause teeth discoloration unlike other dental products with chlorhexidine. DioxiRinse can also be used to keep toothbrushes clean and germ-free. DioxiBrite toothpaste is another product with DioxiCare. This product has active chlorine dioxide that kills bacteria and viruses faster than other products with stabilized chlorine dioxide. It also has powerful oxidizing action similar to hydrogen peroxide that leaves teeth whiter. DioxiBrite contains fluoride that prevents cavities. It also prevents tooth decay and gum disease caused by tartar and plaque buildup.The chlorine dioxide property seeps in between tooth surfaces and gums and other hard to reach areas in the mouth. This product contains zinc, an oxidizing agent that helps maximize the effects of chlorine dioxide. Just like DioxiRinse, DioxiBrite toothpaste kills bacteria that causes mouth odor and gum disease. Its active ingredients also kill odor-causing bacteria. The toothbrush used with DioxiBrite also stays clean and bacteria-free. This product is best used with DioxiRinse to reach its maximum effect. Dentiva Oal Hygiene Soft Lozenges contain triple-acting ingredients. The xylitol in Dentiva lozenges destroys bacteria and plaques that cause cavities. It also kills bacteria that causes gum disease and mouth odor. Dentiva also comes with menthol for a fresh minty taste. It contains ingredients that maintain the mouth’s normal pH to prevent the growth of microorganisms. Using Dentiva offers all day dental hygiene. This comes in a handy pack that people can place inside bags or pockets and bring anywhere. This product is great for those who need instant help with halitosis or those that just want to have minty-fresh breath. Using Dentiva is better than eating menthol candies because it’s sugar-free. It’s also good for diabetics and doesn’t aid in bacterial growth as lozenges with sugar do. 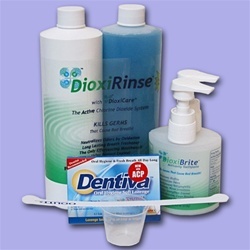 DioxiRinse, DioxiBrite and Dentiva together offer the best dental care. They contain active ingredients that thoroughly kill targeted bacteria and viruses. They clean the mouth including areas that are commonly missed. This home halitosis kit guarantees the desired results with regular use. Daily use of DentiRinse followed by DentiBrite and quick touch ups of Dentiva leave the mouth in its best condition. About the author: Dr. Anthony Dailley is a practicing dentist that specializes in halitosis treatment. He has been practicing since 1981 and graduated from San Francisco State University with a degree in Cell & Molecular Biology, and obtained his dental degree from the Pacific School of Dentistry. Dr. Dailley founded the The Center For Breath Treatment in the San Francisco Bay Area and conducts research on curing halitosis. Dr. Dailley has also been a founder in a biotech company called NovaBay Pharmaceuticals and on their board of directors from 1997 -2014. In addition to treating halitosis, Dr, Dailley also runs an online store where you can buy bad breath treatments. I'm reading: Breath Treatment Starter Kit – Product ReviewTweet this! Osteoporosis involves the loss of bone material information. When you lose a tooth, the jaw bone inevitably weakens. One of the ways to keep the job on stronger this to keep on chewing. But this will not be possible if you have plenty of missing teeth or rely on partial dentures quick guide. Was skeptical this might work well, but following my personal dentist suggested it' was surprised about the results. Cold and hot food as well as beverages in addition to even chilly atmosphere might trigger me personally pain. Because using this toothpaste I have had no level of sensitivity at all dgtoothpaste.com.